We’ve been seeing Internet-enabled TVs for the past few years at CES, but 2011 is the year people will start both buying them and using their capabilities. Ignore the Dish box in the above photo…all the smart-TV capabilities are right in the Sony HDTV itself. 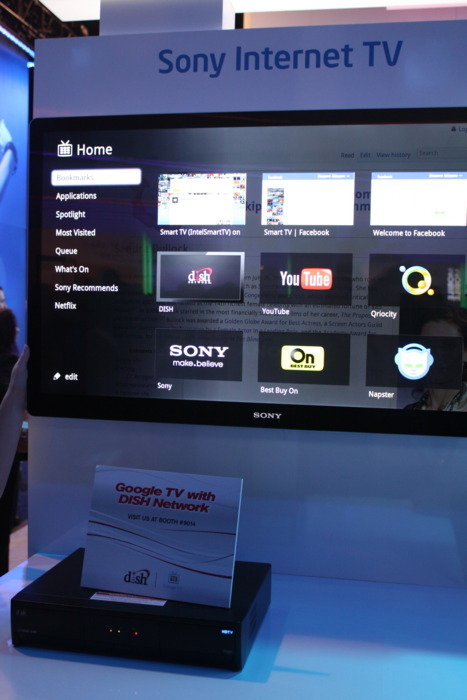 The above is a 46-incher which includes a full computer inside with integrated Google TV. It’s early days for Google TV, but as of now 10 apps come pre-installed (Netflix, Pandora, Napster–the usual suspects). As with all new platforms, I don’t think even Google knows what Google TV will end up being; that’s up to the developer community. So look for an app store to launch soon. And because this is Google, look for contextual ads to come soon as well, followed by improved audience analytics. Call it a hunch. 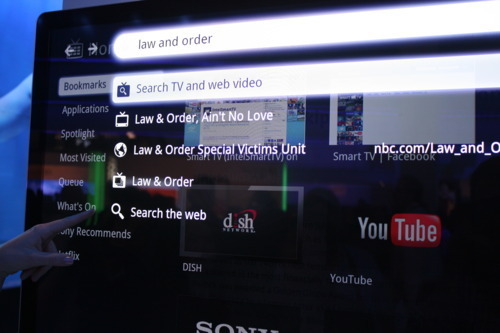 One of the gee-whiz features of Google TV is integrated search (shown below)–punch in “Law and Order” and you’ll get search results from broadcast listings, the web, and your TV’s local storage. “But wait,” you’re saying. “My TV doesn’t have a hard drive.” Your next one will. The other cool feature is the price: This 46-inch LCD is available now for $1,399 at Best Buy and direct from Sony. You can also get Google TV with Sony Blu-ray players, and Logitech has a box out as well. I’ll check out a couple other smart TVs later this week, so stay tuned.